In this review of the fifth International Workshop with Bruce Forman and Uli Hoffmeier it might happen that I repeat myself. So I could stop here and recommend to the reader to check out the reviews of the past few years and enjoy the deja vu. The courses tend to repeat themselves – for good luck in a positive way. And each workshop week develops its very unique dynamic atmosphere in the end. 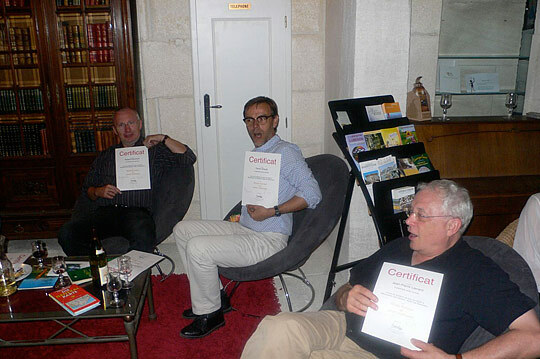 The particular of our course in Provence results from the cooperation of the participants. We, the organizers, can just take care of the basic conditions. 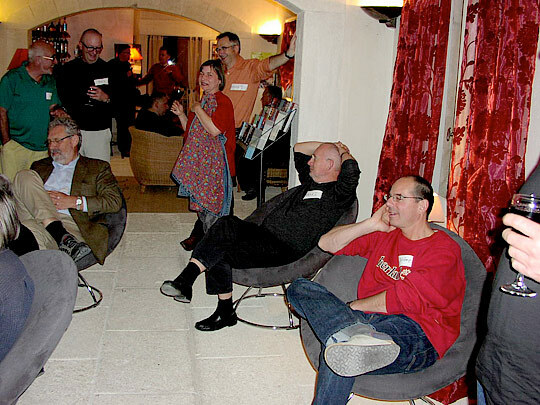 The actual mood on the course is created by the casual and unrivalled association of the participants with each other. Of course we aim for everbody leaving with a smile on one‘s face and being happy about the event at the end of the week. And I strongly belief we succeeded. We already got very positive feedback and response from the participants while the course was running. All participants were higly satisfied with the lessons, happy about the accommodation (sorry to the overbooked attendees at the Best Western Hotel) and delighted by the exquisit meals. 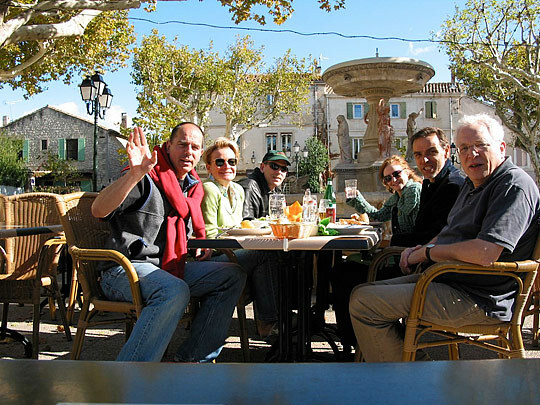 The village of Maussane-les-Alpilles and the environment left nothing to be desired regarding scenic impressions and the french air. Each year the cast of the course is different from the year before, so you never know how the week will be going on. Of course there is a constant factor which is that half of the guys are repeated participants. You even can call them veterans and they really like to come back each year. This leads to a big hello at the arrival day and it makes shure that there will grow no ice at all which needs to be broken. However some questions arise: How will the new participants feel, will they be ignored, will they step up to themselves, do they dare to join the sessions? Luckily it worked out to involve them. When the closing concert comes up a momentum arises which nobody can escape. You can notice some special kind of excitement in the group which stimulates everybody who wants to play at the concert to a creative peak. Even those who „only“ sit in on the ensemble are hooked. You can realise this when the guys were missing at the evening sessions or they disappeared all of a sudden and then you could find them retreated somewhere in the hotel for a rehearsal. By all means, this collective action, the thrill of playing live on stage, welded the group together. You are standing in front of the audience, only the single moment counts, you absolutely want to deliver and do it right. The listeners are all on edge. What can be expected from this bunch of guitar maniacs who occupy the village? Do we need to consecrate the church again? Not at all! And afterwards when everything went well and the tension has dropped off, you back-slap each other, eyes are shining and you know you can take home a unique event. Besides the dayly lessons and the all day sessions the concert is another musical highlight of the workshop week. Unfortunately it did not work out to get a hall in Maussane, the administration did not cooperate. But at this point our all time supporter Gilles Ribeaudeau jumped in and quickly organized the church at his residence Boulbon, half an hour off our hotel. For us a very common situation since the concerts of the previous years took place at the church of Aiguèze. The set list was manifold. 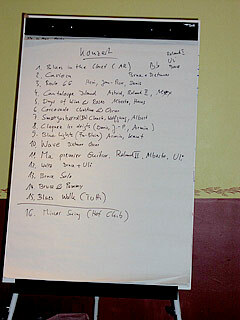 Fifteen songs were perfomed, most of them as a duo or trio. 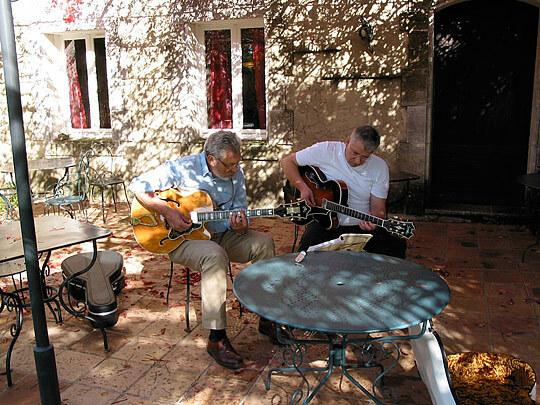 It included Blues in several variations, Latin and Waltz Musette and even guest appearances of two very charming singers, Christine Gutknecht from Montpellier and Bruce‘s wife Pamela. Both tutors performed two stunning waltzes Musette and Bruce was brilliant at a solo performance and a duo with his wife. The Blues walks into the closet? Again and again the tutti pieces wow the audience when over twenty guitarists make the venue ring with „Blues in the Closet“ and „Blues Walk“. The latter was performed with elements which were developed during Bruce‘s and Ulis‘s lessons. And this created a feeling of having composed a new original. An impressive wall of sound is erected when so many guitars sound at the same time, con amore but filling the space anyway. That is a very nice example of how the acoustic guitar works so well, even without ampification (please excuse this remark, I had to make it in my capacity of being a luthier). At this point the only unpleasant incident of the course must be mentioned. One of the participants charted even three songs for the concert and wanted to be accompanied by the computer program Band-in-a-Box. This was wholly unacceptable for us (organizers and tutors). 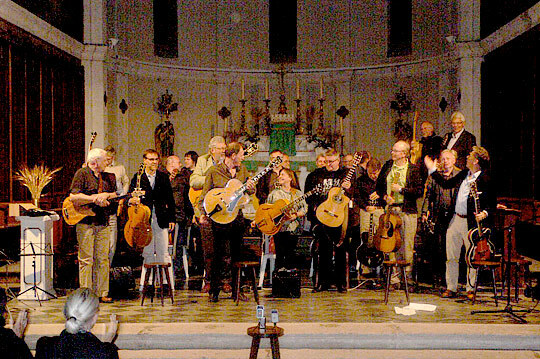 We regarded a play back performance a no go situation on a concert where twenty gutarists can play and want to play. Therefore this participant was adviced to set the computer program aside and play with some of the other guitarists or perform solo instead. He declined this and sadly, he turned his appearance down. Some words need to be said about the core of the workshop, the lessons. As usual two groups were formed. This year Uli tried to arrange the participants according to their qualification of playing (as far as he knew them and could judge their playing). This might be a good idea even for future classes since then the groups are more balanced regarding capability of playing and the learning effect is better. This year the course had a headline, „The Blues“. With giving an issue we wanted to bundle the contents of the lessons so that the attendees could get the point of view of the tutor on this particular theme. Bruce Forman held his lessons spontaneously, mostly without handouts. Every now and then he used a flip-chart to line out his ideas when he drifted off into an augmented harmony of the Blues. Bruce Forman held his lessons spontaneously, mostly without handouts. 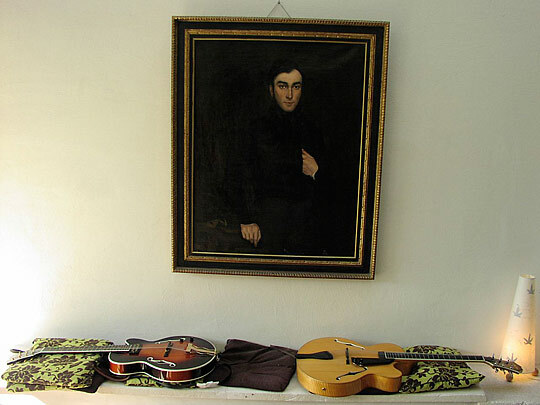 Every now and then he used a flip-chart to line out his ideas when he drifted off into an augmented harmony of the Blues. Bruce‘s lessons even were of philosophic nature, but yet derived from practice: His background is, music is communication. This means to him listening, primarily listening to each other and reacting to each other. This approach was spiced up by Bruce with anecdotes out of his long career as a musician and backed up with a bunch of very useful musical examples. And he emphasised that the participants got enough time for playing and trying out his ideas and suggestions. 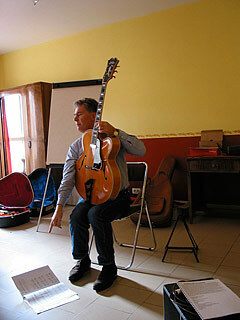 Uli Hoffmeier took care of a practical basis which was useful for beginners and advanced players in the same way. 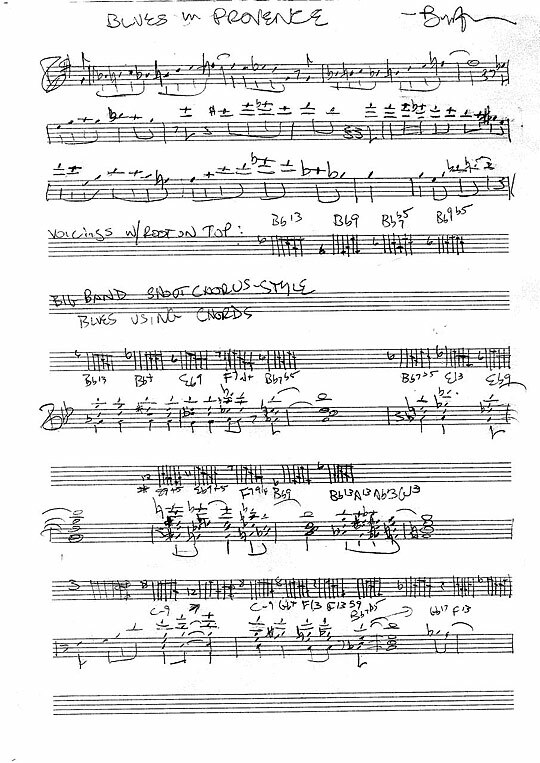 Relaxed and humorous he tought basics and eleemts of the Blues, which he collected in a voluminous handout. Licks and riffs, variations of comping and complete tunes were explained and the group imrovised over this material. 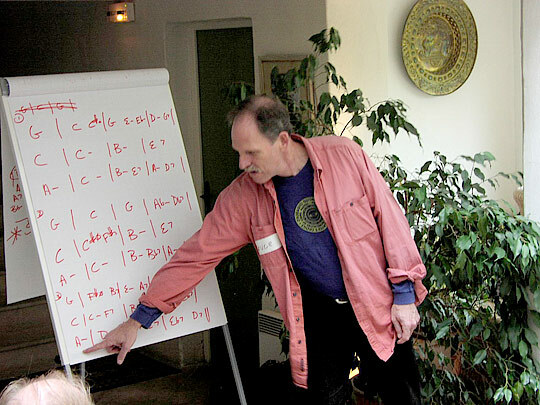 Uli‘s zippy Berlin way of teaching was way off boring and he also provided a fair amount of time to try out the freshly learned stuff. 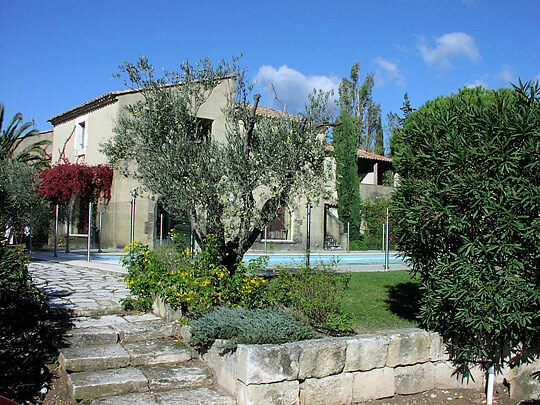 Or new venue, the hotel Val Baussenc at Maussane situated at the foothills of the Alpilles in the heart of the touristic area of Provence, turned out to be a stroke of luck. It has a very charming atmosphere, exactly the right size to acommodate our group and the hotel boss learned to love us by the end of the week. He highly praised our enjoyable groub which did not need much maintainance. No wonder, since there was nothing to be complained about. Food was suberb, the staff was attentive, the rooms very convenient and the ambience très agreable. We could cut the price for singles about 25% but this did not affect the quality of meals or acommodation. The only blemish was that the hotel could only provide one seminar room. One group had to spread out itself in the lobby, but even that worked out fairly well. Next year the workshop will be held a little bit earlier, so maybe we can make use of the patio in front of the hotel. In the end the boss was so delighted by us that he promised to bring the concert to Maussane. After listening to our evening sessions and having heard of our successful concert in Boulbon he could not understand that the administration of Maussane missed out on this event. Now we hope that he has better influence on these hard hearted clerks than we could do. After the participants had checked out the concierge sadly noted that it was way too quiet then and she will miss us jolly musicians playing at the lobby. So, is there a better way be be dismissed like that? 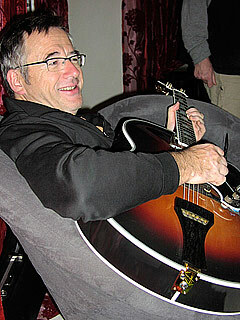 And since the 5th International Workshop 2009 of Sonntag Guitars and Uli Hoffmeier succeded it is not that bad when remarkable events like that repeat, right? À la prochaine à Maussanne, keep swinging!